This week’s major winter storm of almost 2 feet of snow is not unusual for where I live in northern Arizona.. except it has not happened in a few years. This photo was taken on the first clear day after the 4 days of heavy clouds, and the light under the blue sky was brilliant. 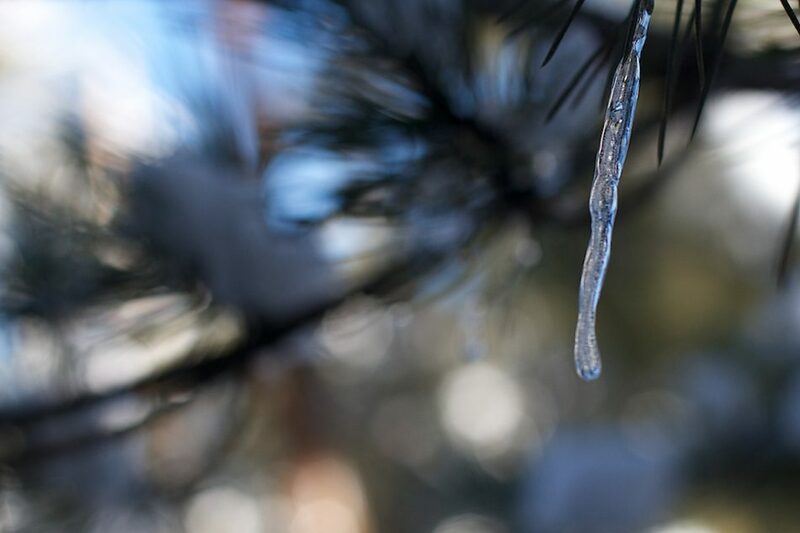 This was a second area of icicles I tried to photograph on a pine tree next to my driveway. I spent some time, without success, trying to catch water drops off of icicles on branches to the right. When I turned in this direction, the solitary icicle wrapped around a single pine needed got may attention. This was the second or third photo I snapped, the previous one was closer to centered. On seeing that image on the camera, taken at f/2.8 with some bokeh and interesting patterns, moved slightly to put the icicle more on the right 1/3 vertical. I also changed aperture to f/4.0 maybe to see if I could get more focus depth. The bokeh was a tad smaller in this photo, and a bit more defined. In Aperture I probably add some sharpening, and definitely used the brush to sharper the icicle. The detail on the top of it is crisp; I wish I had a bit more focus on the tip of the icicle. But the real nice thing in the photo is the abstract colors and shapes of the background and the blue sky. I like the feeling o depth from icicle in the foreground, then the blurred shape of the branch in the middle, and all the abstract background detail from the area across the road, where the light is bright. No one would ever know, but I can see on the top edge, about 1/3 the way in from the left, the color from the stop sign across the street. This seemed like a good picture, and posted in flickr as my daily photo for January 9, it picked up a few Depth of Field loving comments. But the pleasure with the photo peaked a bit more just now, as I got a message that the photo was added to Flickr Explore. 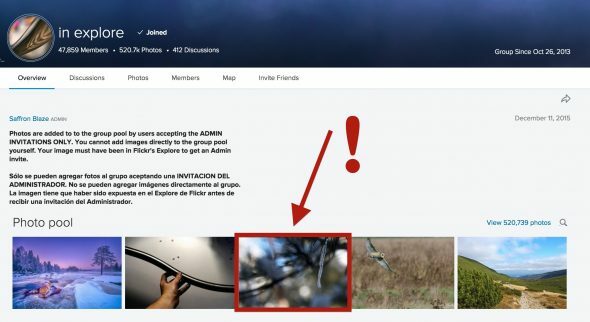 I quickly grabbed a screen shot of the In Explore group (this is the way I usually find out, they notify you). I feel fortunate to hit an Explored photo in the first 10 days of the year. It’s like winning the lottery when you did not even know you had a ticket. UPDATE January 11, 2016: Wow, up to over 5000 views, that’s what Explore does. Thanks flickr. Posted on January 11, 2016 January 11, 2016 by alan. This entry was posted in In Explore, Inside the Photo, Things and tagged bokeh, ice, icicle, winter. Bookmark the permalink.